"This is a great recipe for leftover turkey. Even those who say they don't like turkey will eat this. May be assembled in advance and frozen: heat covered dish at 350 degrees F (175 degrees C) for 1 1/2 hours." Preheat the oven to 400 degrees F (200 degrees C). Bring a large pot of lightly salted water to a boil. Add the pasta and cook for 4 minutes, or until almost tender. Drain. Melt the butter in a saucepan over medium heat. Add the onion; cook and stir until tender. Stir in the flour until blended, then gradually stir in the milk so that no lumps form. Season with salt, pepper, poultry seasoning and mustard. Cook over medium heat, stirring constantly until the mixture thickens. Remove from the heat and add 2/3 cup cheese and pimento, stirring until cheese melts. 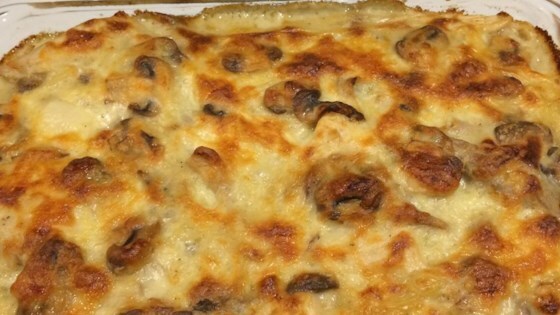 Add undrained mushrooms to cheese sauce. Place a layer of pasta in the bottom of a 9x13 inch baking dish. Cover with a layer of turkey, and then a layer of cheese sauce. Repeat the layers. Sprinkle remaining 1/3 cup cheese over top. Bake for about 25 minutes in the preheated oven, until sauce is bubbly and cheese on top is toasted. This is a good recipe. Used one cup milk and one cup half and half for a creamier sauce. Cut the pasta in half, as the last time I made this it came out too dry. I have made this recipe for years. I add 2 tablespoons of sherry to the mixture after I add the cheese.